Drowning. Confined spaces. Darkness. Swimming under obstructions, unsure where — or whether — you’ll emerge. A visit to Sawa-i-Lau Caves pushes several of my basic fear buttons. I’m okay with darkness and tight spaces, but the mere thought of swimming underwater from one cave to another is enough to trigger a cold sweat. So it was with some trepidation that I boarded a dinghy bound for the caves, hidden within a small, rocky island in the north of Fiji’s Yasawa Islands. 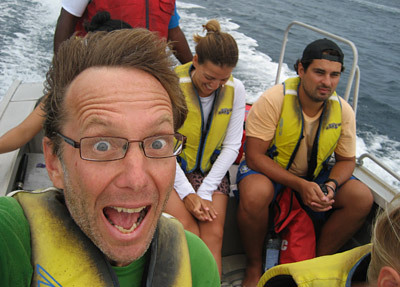 Thirteen of us piled into a five-metre aluminium dinghy equipped with six lifejackets. It turned out the boat trip was half the adventure. “They told me only four people were coming,” our driver grumbled as he coaxed the outboard into life and re-arranged the passengers, shifting the hefty German lads around until the dinghy was on an even keel. We followed a string of islands, their grassy spines broken by towers of solid lava, and skirted a series of shallow reefs. I wondered why our driver was chugging along so slowly until another boat crunched to a halt on a reef. Once we hit open water our driver found the throttle. He also found a swell. Within minutes everyone in the front of the dinghy was soaked. Someone at the rear of the boat kindly handed me a dive mask so I could see vaguely through the spray. The author en route to Sawa-i-Lau Caves. What I saw, just, was an island that wasn’t like the others. The rest of the Yasawas are rolling, grass-covered and volcanic; Sawa-i-Lau is a limestone oddity, bare, black and slightly ominous, with cliffs rising sharply from the sea. We were delivered dripping onto a beach and, after the inevitable safety briefing, pointed in the direction of a concrete staircase snaking around the rocks to a door set into the side of the island. Once my eyes adjusted to the dim light I saw another flight of steps descending into a watery cave. Leaving everything but my togs and mask behind I jumped into a surreal world. 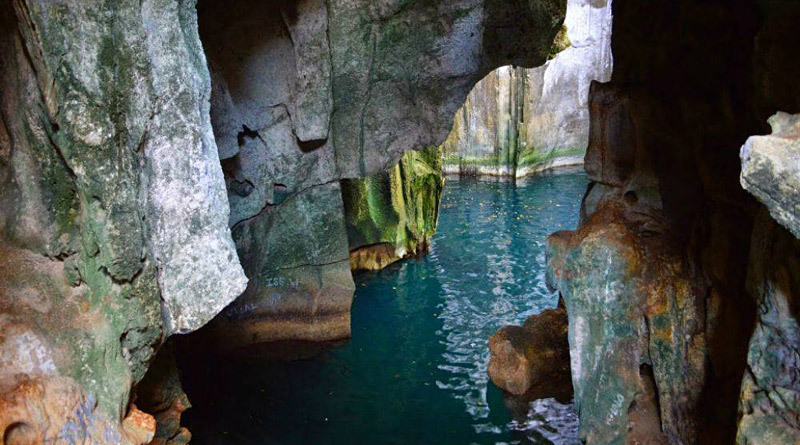 The water inside Sawa-i-Lau Caves is constantly replenished by unseen passages to the sea. The roof soars 15m above the water like a cathedral vault — one limestone outcrop even looks like a pulpit — and light filters through an opening in the roof framing a tree-lined square of sky. 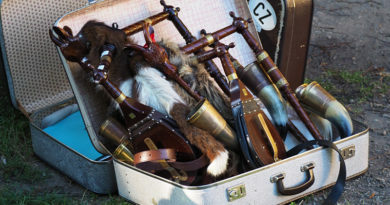 The real buzz, however, comes from visiting the next cavern. The catch is that it’s connected to the first only by an underwater passage. How would I know I wasn’t going to bump into someone squeezing through the other way? How would I know when to surface? And how could I be sure there really was air on the other side? 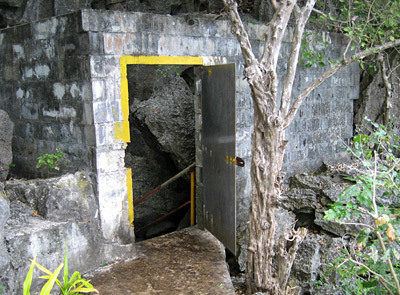 Entry to the caves is via a door in the side of the island. The waiver I’d been ordered to sign didn’t make me feel any better. It detailed several unpleasant ways of dying or being maimed, and made it clear I’d forfeited all rights to legal recompense. I contemplated quietly sneaking back to the boat. But how would I answer the inevitable questions about the caves? And would I reproach myself forever for being a chicken? Luckily a guide had stationed himself at the entrance to the passage. He was friendly, as all Fijians seem to be, but probably unsympathetic to a grown man’s whimperings. He told me to swim towards the light — straining my eyes I could see a feeble glow which looked to be several miles away — and asked if I was ready. “Yes,” I said, meaning ‘No’. Without further ceremony he placed a firm hand on the top of my head and pushed me underwater. When I popped up moments later another hand grasped the top of my head to stop me hitting the roof of a low passage. 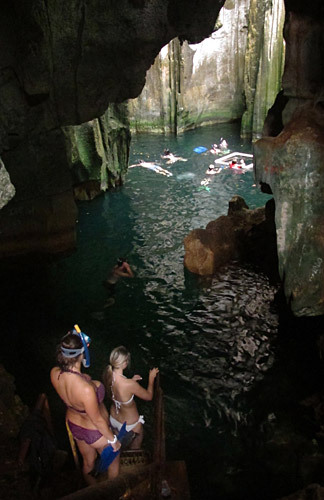 Swimmers descend the stairs into the first cave. After a few strokes I was in another cave. This one was entirely dark but from the occasional torch beam I could see the chamber was almost as large as the last but with a much lower ceiling. It was an extraordinary feeling to float in darkness inside an island, cut off from the outside world. I was wondering how fresh air entered the cave when I saw a faint glimmer in the distance. Swimming towards it I found a passage leading to a sublimely beautiful third cave, lit by a narrow shaft through the limestone to the top of the island. I could have stayed for hours but the boat was waiting. I was, as usual, last. A slightly concerned guide came looking, making sure I was okay. I was more than okay, I told him. It turned out swimming through the underwater passage was no big deal. It’s easily done by anyone who can hold their breath for a few seconds and swim a few strokes underwater. Next time I won’t be quite so chicken. 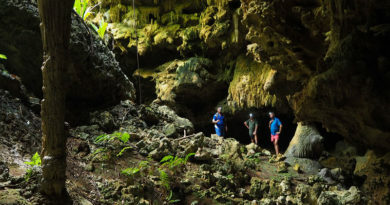 Sawa-i-Lau Caves are in the island of the same name in the north of the Yasawa Islands, an arc of 20 or so sparsely populated islands northwest of Viti Levu, Fiji’s main island. 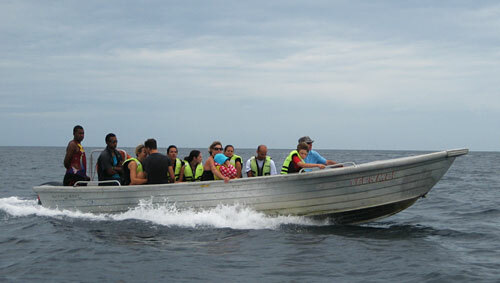 Most resorts in the area offer trips to the caves, as does a local company called Joe’s Water Taxi. In 2016 the half-day trip cost roughly F$60 (NZ$42) with F$10 going to the island’s customary owners. Some operators include the owner’s fee in the trip price while others require it to be paid on landing — check if you need to bring some cash. Bring a mask for swimming into the second cavern. A snorkel is not essential. 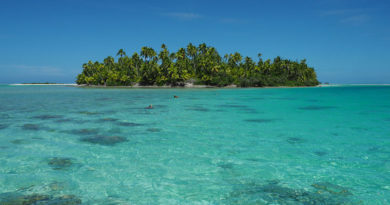 Accommodation options include the Fijian-owned Coralview Resort on Tavewa Island, a 40-minute boat trip from the cave. 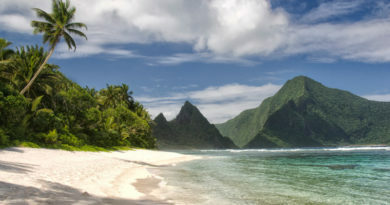 Prices in 2016 ranged from F$42 (NZ$30) a night for a dorm bed to F$130 (NZ$92) for a two-bed bure or F$162 (NZ$115) per person for a beachfront bure. 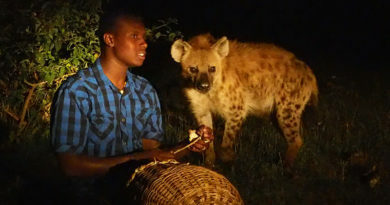 The obligatory meal package cost F$89 (NZ$63) a day. Coralview is served by a daily catamaran from Nadi’s Port Denarau. The trip takes about five hours each way. See www.fiji.travel for more information. The Sawa-i-Lau Caves are riddled with legends. One tells the story of a young chief who hid his beloved in the cave after her family threatened to marry her off to a rival chief. He would swim into the hidden cavern each day with food for her, until they could escape together to the safety of another island. Another legend claims the caves are home to a ten-headed ancient Fijian god known as Ulutini. A more modern tale, the 1980 movie The Blue Lagoon starring Brooke Shields, was partly filmed inside the caves. The author visited Sawa-i-Lau Caves as a guest of Tourism Fiji and Coralview Resort.